When it comes to surgery, Ganim said, good planning can be the difference between life and death. And that makes getting an accurate picture of what’s going on beforehand imperative. But even the most technologically advanced MRI and CAT scan machines produce only flat-layered images of what she’ll see in the operating room, and Ganim’s knowledge of human anatomy is all she has to turn over in her mind. Replica organ models, however, like those printed by biomedical engineer Greg Gagnon in an office in Baystate’s intensive care unit, can get her as close to reality as possible without actually cutting a patient open. Single-handedly — with support from the hospital’s administration — Gagnon, who is entirely self-taught, is changing the way Baystate surgeons plan for their work. “This kind of modeling helps me to sleep better, because I can imagine it much more easily,” Ganim said. Sitting at a table in her Springfield office, she picked up a plastic replica of a large tumor on a patient’s rib cage compressing the right lung. “On the CAT scan, it wasn’t really clear what was going on,” Ganim said. She sent the scans to Gagnon, who used software to convert the layered images into a 3-dimensional model, isolate the tumor, rib cage and lungs, and print a replica, to scale, using three types of plastic to distinguish the different elements. “It was a great illustration, and I was surprised how much more clear things were for me,” Ganim said. 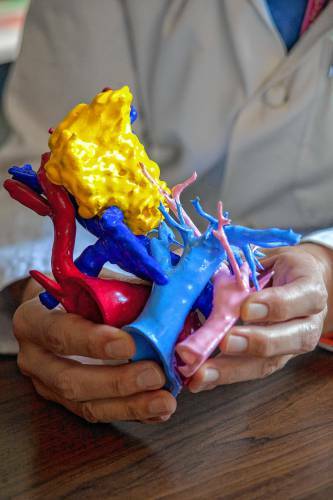 During the surgery, the doctor was able to remove the whole tumor, solidifying 3-D printing as a routine way for her to plan for complex surgeries and educate her patients.